Missing Person: Baleriano Medina, 78, Male, Hispanic, 5'07", 300 lbs. Last seen: Friendship, WI 6:00 PM 10/06/13. Baleriano Medina, 78, Male, Hispanic, 5'07", 300 lbs. Last seen: Friendship, WI 6:00 PM 10/06/13. 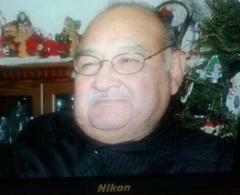 Baleriano Medina, age 78, is missing from Adams County, Wisconsin. Baleriano was last seen at his residence near Friendship, Wisconsin in Adams County on October 6, 2013 at 6:00 PM. Baleriano had contact with Law Enforcement in Sparta, Wisconsin at approximately 11:30 PM on October 6, 2013. Baleriano is 5’07” tall, weighs approximately 300 pounds, is balding with gray hair, and has brown eyes. Baleriano is driving a gray 2002 Chevrolet Avalanche truck with Wisconsin Truck Registration JF7139. Baleriano may be experiencing a medical condition and his destination is unknown. Anyone with any information on Baleriano’s whereabouts please contact the Adams County Sheriff’s Office at (608) 339-3304 and reference case number 13-6426 or your local law enforcement agency.